A rebadged version of the Brymen BM251 and of the same series of the Brymen BM257 (which is also rebadged by Greenlee as the DM-510A), the Greenlee DM-200A is the base meter of this series. This is a great general purpose electrician’s multimeter, classed by many as a cheaper, viable option to an equivalent Fluke. With this solid, UL-listed device, you have the ability to data log and detect voltage, as well as measure frequency and standard multimeter measurements. The Greenlee DM200A is the base model of this series. It lacks the features of the other two and averages out RMS when measuring AC. This is not an issue for general purposes, but will mean less accurate results if trying to measure complex drive systems with non-linear waveforms. Though it lacks temperature and capacitance, it has Max/Min and relative modes and can also data log – you’d need to purchase an RS232/USB serial cable to enjoy this capability. It also offers auto as well as individual manual ranging and the continuity checker is fast and has a solid beep. The low voltage diode tester is a bit of a letdown – not powerful enough for testing some of the colored LEDs. EF voltage detection: Voltage/current detection works well on the Greenlee DM-200A. It is good for ‘seeing’ live wires in walls and has signal strength and audible indicators. The sensitive is good; it can pick up breaks in cables, for instance. The voltage range is between around 10V and 1000V (at 50-60Hz). Modes: On Max/Min mode, measure interval is 50ms and will display you the highest and lowest values of a signal. Relative mode compares two readings. Frequency is shared with the same button. Model Differences: Accuracy levels with the others in this series – the DM-210A and DM-510A – are similar. Differences include the omission of temperature and capacitance, plus the DM-510A is True RMS and has an AutoCheck function. As far as Asian-made multimeters go, Greenlee (or Brymen) are probably as good as it gets regard to safety and build quality. They are on par with the Chinese-built Fluke 110 series, featuring the required input protection to safeguard against high voltage surges. Category ratings are: CAT-II 1000V, CAT-III 600V, and CAT-IV 300V. This signifies a surge rating of 6kV at those given ground voltage energies. You may see cheaper multimeters with higher ratings, but these are likely not tested against their touted high ratings and should not be trusted in high energy situations. In addition, the Greenlee DM-200A has a well built mother/daughter board, complete with good components and isolation slots. Fuses are expensive, high rupture capacity type: 600mA and 8A. To go with the solid input protection is a strong case with a tough rubber boot – green with Greenlee, red with Brymen. A kickstand is built into the holster, under which is an easy to remove battery/fuse panel. You can get at the fuses and batteries via this panel. This unit also has a solid dial selector switch and good quality test lead probes, complete with sharp tips, strain relief points and good banana plugs. Display: The large, clear display is the DM200A’s most impressive attribute at first glance. It is 6000-count with a nice backlight and responsive bar graph. The main display is quick to update, at around four to five refreshes per second, with the bar graph updating at 40 times a second. The rest of the interface, including the dial, buttons and input jack sockets, are clearly marked. This is a very easy to decipher and easy to use meter. There are just six functional dial positions, including separate AC and DC voltage positions. Micro-amps also has its own range, while millivolts is DC/AC. Auto power-off: This kicks in after 30 minutes of inactivity. There is also a low battery warning indicator – note: readings are inconsistent when the battery is low. BEEP-JACK: This helps guard against plugging the wrong leads in when testing volts or amp, for instance. The meter will beep and display ‘InEr’ when you get it wrong. 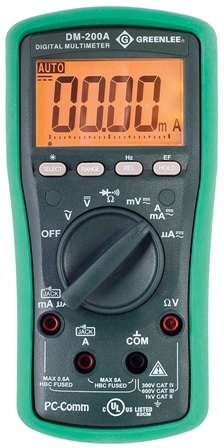 The Greenlee DM-200A review has a cheaper version of a Fluke with similar build quality. Electricians and hobbyists get a solid piece of equipment that includes a useful voltage detector and good measurement ranges. Accuracy, speed and input protection are all good, although it averages out RMS. If you need more features, consider the DM-510A which is True RMS.